Rather than cook up its own unique version of wireless charging, Apple has instead decided to utilize the established Qi wireless charging method —an open standard run by the Wireless Power Consortium, which welcomed the news on Tuesday. "Today marks a pivotal day for wireless charging, and those that stand to benefit are consumers," Paul Golden, vice president of market development for the Wireless Power Consortium, said in a statement. "With Apple's announcement to include Qi wireless charging in the iPhone 8, iPhone 8 Plus and iPhone X, we expect to see rapid acceleration in consumer adoption and an increase in category innovation. We're closer to the day of ubiquitous access to wireless charging, giving people a convenient, always-charged experience." 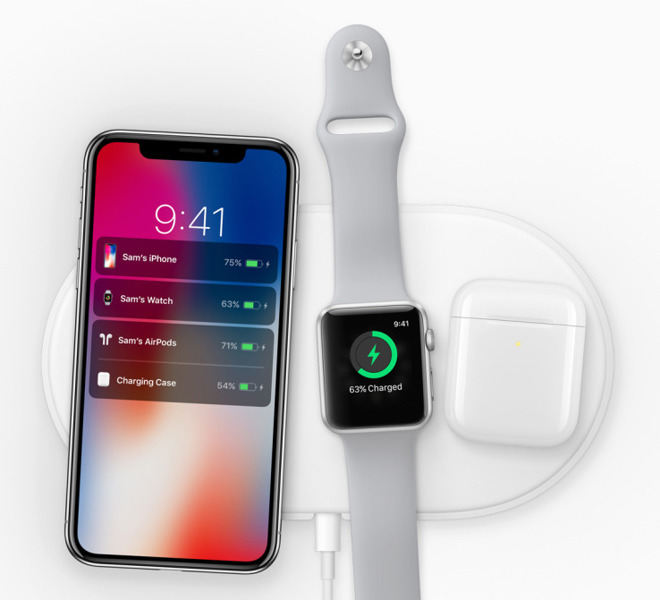 As part of the iPhone X and iPhone 8 unveiling on Tuesday, Apple boasted that its next-generation handsets will work with wireless charging stations and mats already available around the world, including publicly available options in hotels, cafes and airports. The company also plans to offer its own AirPower wireless charing pad for new iPhones, Apple Watch, and a revised AirPods case, though it won't ship until 2018. AppleInsider was first to report on Apple's forthcoming multi-device wireless charging accessory. In the interim, new authorized accessories from Belkin and Mophie will help fill the void with wireless charging capabilities. And because the iPhone X and iPhone 8 use the Qi wireless standard, other products already on the market should be compatible as well. The Wireless Power Consortium says Qi-compatible chargers are already installed in thousands of public locations worldwide. To date, more than 90 smartphones are Qi-enabled, and nearly 80 car models also include support.